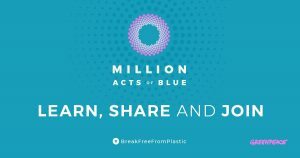 We’re inviting people around the world to be part of A Million Acts of Blue for a plastic-free future. Will you join us? We live in a disposal-centric system where corporations push mass production and consumption of single-use plastic products. About 90% of the plastic produced to date has not been recycled, creating a massive plastic waste and pollution problem. The flow of plastics into our environment has reached a crisis level, and the devastating impact is most evident in our oceans. The equivalent of a truckload worth of plastic enters our oceans every. single. minute. Plastic can take centuries to break down and this pollution continues to rapidly accumulate in the marine environment, breaking apart into smaller pieces and microplastics that are making their way throughout ecosystems, and even into the water we drink and the food we eat. To truly tackle the plastics epidemic, companies need to fundamentally rethink how they bring products to people. That could include refill and reuse systems, or totally new delivery systems — but the time has come to stop using throwaway plastic for good. 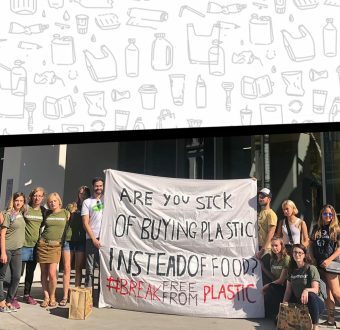 More than one million Greenpeace change agents have taken action globally over the past year, calling on corporations to stop producing single-use plastics. 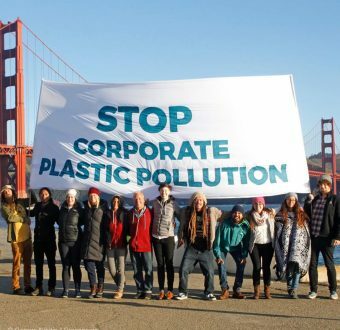 If you haven’t already, sign our petition to demand that big corporations do their part to end plastic pollution! We’re inviting you to be part of a Million Acts of Blue to turn the tide on plastic pollution by taking action to stop it at its source. Check out our toolkits below and see how you can be part of the solution! 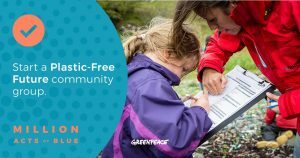 Whether you are a teacher, student or concerned individual wanting to learn more about plastic pollution, we have prepared some resources to help you give a presentation to inspire your students, peers or community to join the plastic-free movement. Traditional media such as newspapers, TV, magazines and radio and digital format remain some of the best options for reaching large numbers of people. Placing a letter to the editor in your local newspaper can be an effective way to share knowledge with other people in your region. Here are some tips! Supermarkets are a hub for single-use plastic sales. There are many ways to influence your local grocer or a major supermarket chain. 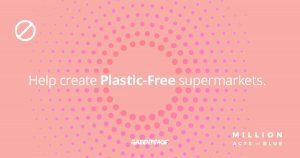 Advocating that your supermarket go plastic-free can help provide the incentive they need to move in the right direction. 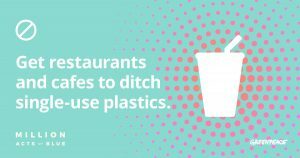 A growing movement is urging fast-food chains, restaurants, and cafes to lead by no longer offering their customers single-use plastic. Don’t underestimate the power of getting even one location to change, you can use it to encourage or pressure other businesses to follow suit! 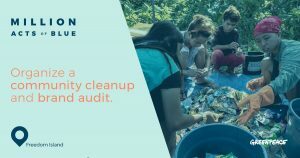 Through brand audits, the #BreakFreeFromPlastic movement holds corporations accountable and drives calls for innovation in product packaging and waste management. If you want to host a brand audit in your community, here are some options for you. 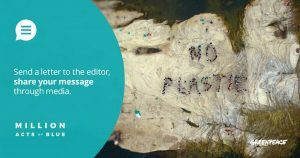 To stop plastic pollution at its source, we must build a people-powered movement strong enough to challenge mindsets around throwaway culture. Reach out to your community to make change happen together.